If you have been researching cannabis for glaucoma, you may have read that cannabis can be detrimental by lowering blood pressure at the same time it lowers IOP, potentially causing problems even as it helps. This concern may be unfounded, however, as a 2004 article published in the British Journal of Ophthalmology describes the vasorelaxant properties of cannabis, which may instead cause increased blood flow to the optic nerve. Cannabis’ neuroprotective properties can also help people suffering with glaucoma. The plant’s interaction with our central nervous system (where many CB1 receptors are located) means cannabinoids protect neurons, and stave off many different neurological conditions. This protection can also extend to the optic nerve, and prevent degradation that could cause or worsen glaucoma. Additionally, cannabis is well-known for its ability to tackle some secondary symptoms of glaucoma, such as pain and nausea. Cannabis has been considered as a glaucoma treatment for some time, beginning in the early 1970s when two scientists noticed the natural plant’s ability to ease interocular pressure. Tests following this discovery have shown cannabis – in doses containing as little as 3% THC – to be as effective as some glaucoma medications; both treatments temporarily lower pressure by about 25%. A 2005 study outlined a single patient’s supplementary use of cannabis after several prescription glaucoma medications proved ineffective. For more than two decades, the patient treated her glaucoma by smoking and eating cannabis, and in all that time, she did not experience any further loss of vision. Though anecdotal, this woman’s experience goes beyond symptom management, and holds a lot of promise for other glaucoma sufferers. There are plenty of other anecdotal accounts of cannabis’ amazing effects on glaucoma, some of the most public coming from celebrities like Whoopi Goldberg. Patients say cannabis is the only treatment that helps their glaucoma, and celebrate the fact that its benefits don’t come with the serious side effects of many pharmaceutical drugs. People who have used cannabis to treat their glaucoma symptoms often find the treatment works for three to four hours. Because doctors recommend 24-hour reduction of IOP, the need to re-dose every four hours is the primary draw-back of cannabis. Currently, research is underway to develop eye drops that deliver the healing THC cannabinoid directly to the source, a method that could offer relief without the high that comes from smoking; if successful, THC eyedrops could prove to be a simple-to-use alternative, easily repeated every few hours. Already, some countries, like Jamaica, offer non-psychoactive cannabis-derived products that have been shown to reduce IOP. As early studies show, a high percentage of THC is not required to successfully lower IOP. This is good news for those who want relief without the classic cannabis “high”. cannabis strains that contain low amounts of THC can be administered throughout the day without much effect beyond the intended glaucoma relief. 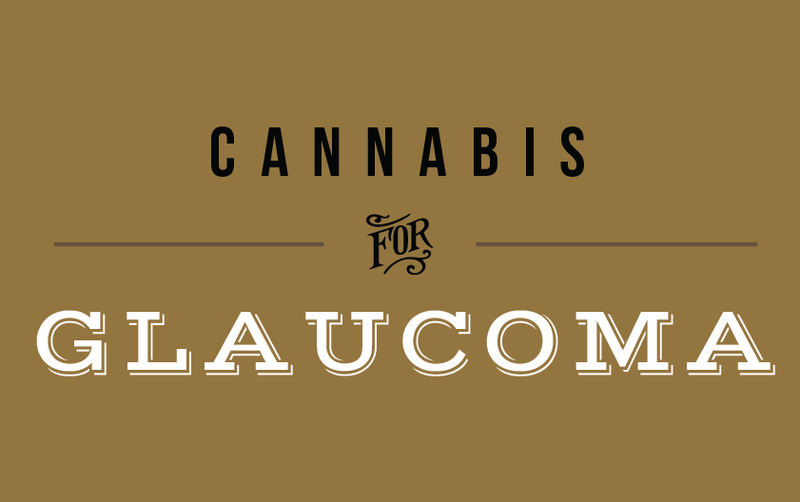 At FARM, we offer numerous strains that can address the symptoms of glaucoma. Whether you plan to smoke, vaporize, or eat your medicine, sativa strains are a great choice for the day, while indica strains offer cheerful relaxation and pain relief later in the evening. For quick and easy relief that doesn’t require any prep, try one of our tinctures. These medications are applied under the tongue, and begin taking effect almost as quickly as vaporizing. Our FARM staff are always happy to help you find the best cannabis strain for glaucoma, or any other ailments you may be experiencing.